The world's leading business plan software, built for entrepreneurs like you! Meet the LivePlan toolset --- the features that reinvented the business plan. Students can learn QuickBooks from anywhere and complete coursework both in and outside the classroom. Easily build a one-page pitch! Quickly and easily build a one-page infographic that visually represents your business opportunity. Share your professional pitch page with lenders, investors, business partners or advisers, and tell the story of your business. Work securely with your team to come up with ideas and easily share them with advisors, board members, and investors -- regardless of geography or system. Share your workload by having colleagues work with you on your business plan or give an advisor access to provide feedback and guidance. With LivePlan, you don't have to plan alone. Easy, error-free financials guaranteed! LivePlan makes it easy to put together your financial projections. Your knowledge about your business combined with LivePlan's powerful forecasting tools will create a bulletproof business plan. Write your whole plan without ever having to look at a spreadsheet. LivePlan simply asks you questions about your business and you plug in the answers. The calculations are done behind the scenes. Our team has a combined 50 years of experience creating business plans and business planning software, so you can trust LivePlan to do the math for you. Impress bankers and investors with a proven, strategic format that impresses every time. Get expert advice and effective examples along the way. LivePlan gives you all the tools you need to create an accurate, complete, great-looking business plan. You need to put your best foot forward when you present your plan, so LivePlan produces professional, printed plans that will impress any audience. Simply download your plan as a PDF to print or share, or export it to your favorite word processing program to give it some final polish. Your business plan will look like it was created by a professional business plan writer. Banks, investors, and SBA-approved lenders look at a lot of business plans. If yours doesn't fit the standard format, you might get stuck at the bottom of the pile. After 15+ years in the business planning business, we know what lenders are looking for in a business plan. When you use LivePlan, your plan will meet those standards. Compare your performance to your peers and to your financial forecasts using easy-to-understand dashboards. Make quick adjustments to your business to stay on track and grow faster. Connect LivePlan to QuickBooks or Xero accounting software and get instant insights that will help you grow your business, starting today. Once you've forecast your revenue goals and created a budget for your business, the next step is track your progress towards those goals. 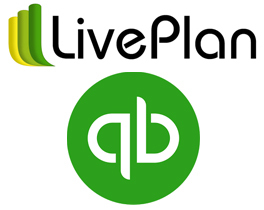 LivePlan connects to your QuickBooks or Xero accounting data so you can see how your actual performance matches up with your expectations. Get the instant updates you need to stay on track with your financial plan. Don't let your key business numbers stay buried in your accounting system. LivePlan gives you easy-to-understand insights for your key business numbers so you know what you need to do to grow your business. Do you need to charge more? Should you collect money faster? How are your profits? LivePlan makes those decisions easy. Get QuickBooks Online Plus - FREE!! QuickBooks makes online accounting easy. Shockingly easy to use. Access from any device. Work at your pace. With instant access to your information, it's business as usual, anytime. Securely connect bank and credit card account to see where you're making and spending money. Snap a photo of your receipt and link it to a transaction for easy tax prep. Automatically download and categorize bank transactions and submit sales tax payments. Create custom invoices with your logo and accent colors to reflect your brand. Customers can easily and quickly pay with credit card, debit card, or bank transfer right from you invoice. Instantly see how your business is performing. Quickly view your profit & loss and balance sheet. Enter employee hours and get instant, printable checks, Or save some trees and use free direct deposit. Note: Free Quickbooks will be sent direct from Intuit and can take up to 3 days to receive via email.